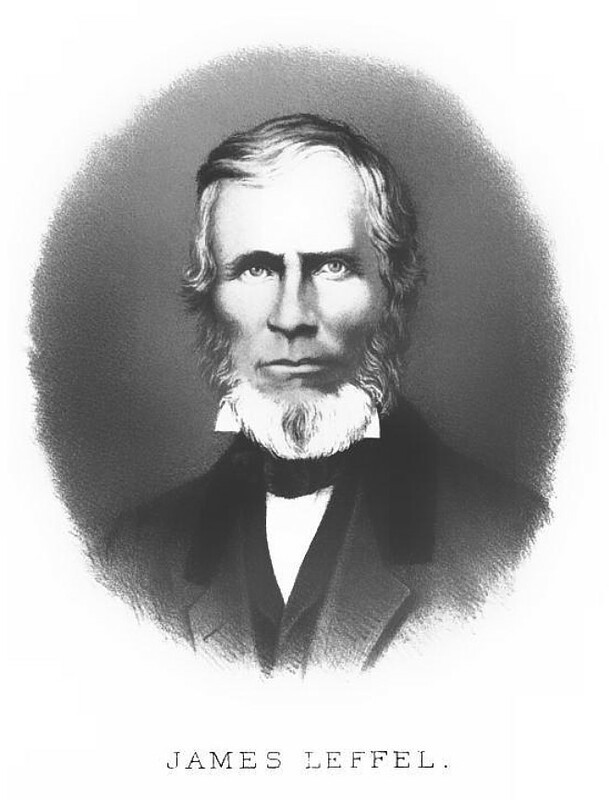 JAMES LEFFEL was born April 19, 1806, in Virginia—his father's name being John Leffel, who emigrated from his native State, bringing his son with him when he was only eight months old, and settled in Ohio near- Springfield. In his youth, James Leffel picked up his education in the small district-schools, there being no colleges in Ohio at that time, working at home, when not studying, at millwright and saw-mill business.^ When still a young man, he moved to Springfield, and started the first foundry in that part of the country, giving most of his own time to inventing, being successful in getting patented many useful and desirable machines, among which was the justly celebrated Leffel water-wheel, which is now known and used all over the civilized globe, and occupies the front rank in the great inventions of the age, conferring a lasting benefit on the manufacturing interests of the country. In place of the overshot-wheel with its ponderous gearing, which were very expensive and a constant source of annoyance, the invention came as a welcome friend. James Leffel died June 11, 1866, in the sixtieth year of his age, after leaving behind him a monument more lasting than that of marble, and a life filled with usefulness, the results of which he bequeathed to the human race. The large fortune he left behind him was gathered together amid toil, fatigue, and danger, and a brief history of Mr. Leffel's life is useful for its practical instruction.